The “Ernesto Tornquist” Provincial Park (ETPP) is located inside the Ventania system (Argentina) and was created to protect one of the last relicts of pampean grasslands. Even though many studies have looked at the vertebrate faunal diversity, biology, and conservation in this Park, few studies have been dedicated to arthropods. Among these, spiders have been used as ecological indicators to evaluate nature conservation status, nevertheless, basic information on their distribution and ecology is necessary for their use as indicator taxa in this region. Thus the goal of this study was to present the phenology and demography of the spider Odo bruchi, a cursorial spider present in the ETPP. For this, spiders were sampled bimonthly using pitfall traps between September 2009-2010 (first year), and March 2011-2012 (second year). A total of 10 traps were placed every 10m along a transect of 100m parallel to the longest axis of a grassland slope with native vegetation. Traps were filled with 1 500mL of ethylene glycol, that were examined and refilled every 60 day period. We collected a total of 799 specimens in two years. Juveniles were the most abundant reaching 47.8% of the total, while males corresponded to 27.8% and females 24.4%. We found significant differences in the mean abundance of O. bruchi: the abundance during spring-summer (Nov-Dec-Jan-Feb) was significantly higher than the other periods of the two years period. Moreover, we found an even abundance distribution throughout the year in the entire study. This work represents one of the first contributions to the ecology of this spider family in the area. Also, our results comprise relevant information to encourage future studies on this spider species as a bio-indicator of the conservation status of pampean grasslands. Key words: abundance, phenology, demography, bio-indicator, “Ernesto Tornquist” Provincial Park. El Parque Provincial “Ernesto Tornquist” (PPET) se encuentra dentro del sistema de Ventania (Argentina) y fue creado para proteger uno de los últimos relictos de pastizal pampeano. Aunque se han realizado varios estudios sobre la diversidad, ecología y conservación de la fauna en este Parque, la mayoría se enfocaron en vertebrados, y solo unos pocos estudios se dedicaron a los artrópodos. Las arañas son utilizadas como indicadores ecológicos para evaluar el estado de conservación de los ecosistemas. Cuando se utilizan especies individuales es necesario contar con excelente información básica sobre su distribución y ecología para la elección del taxón indicado. Es por esto que el objetivo de este estudio es presentar la fenología y demografía de Odo bruchi Mello-Leitão 1938 (Zoridae), una araña cursorial que se encuentra en el PPET. Las arañas se capturaron bimestralmente utilizando trampas de caída entre Septiembre 2009-2010 (primer año) y Marzo 2011-2012 (segundo año). Las trampas se colocaron cada de 10m en un transecto de 100m paralelo al el eje más largo de la pendiente del pastizal. Cargamos las trampas con 1 500mL de etilenglicol y las examinamos y recargamos cada 60 días. Recolectamos 799 individuos en dos años. Los jóvenes fueron los más abundantes con un 47.8% del total, mientras que los machos correspondieron al 27.8% y las hembras al 24.4%. Encontramos diferencias significativas en la abundancia media de O. bruchi: la abundancia en primavera-verano (nov-dic-ene-feb) fue significativamente mayor que el resto de los períodos en los dos años estudiados. A su vez, encontramos una distribución similar de la abundancia a lo largo del año en todo el estudio. Este trabajo representa una de las primeras contribuciones a la ecología de esta familia de arañas. Además, los resultados obtenidos comprenden información relevante para fomentar estudios futuros sobre esta especie de araña como un posible bio-indicador del estado de conservación de los pastizales pampeanos. Natural grasslands are among the most disturbed ecosystems by human activities (Hannah, Carr & Lankerani, 1995), and have received little conservation consideration respect to other ecosystems such as the temperate and tropical forests (Zalba & Villamil, 2002). Furthermore, native grasslands face multiple threats, including agriculture, livestock, urbanization and exotic species invasions (Viglizzo et al., 2001). The expansion of tree or shrub species in a grassland ecosystem generates a great impact because it represents not only a taxonomic addition, but also the introduction of a life-form completely new to the ecosystem (Richardson, 1998). The Ventania system is at the limit of the phytogeographic provinces of Pampa and Espinal, and is home to more than 400 native plant species (Kristensen & Frangi, 1995), many of which are endemic and face extinction risks (i.e., Polygala ventanensis and Senecio leucopeplus) (Delucchi, 2006). 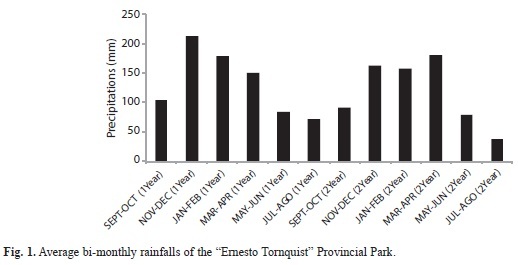 Within this system the “Ernesto Tornquist” Provincial Park was created to protect one of the last relicts of pampean grassland in Argentina (Lizzi et al., 2007). This is a protected reserve; however, in the present time several activities represent considerable threat to this system, such as over-grazing by feral horses (Loydi & Distel, 2010; Scorolli & López Cazorla, 2010), invasion of pine (Cuevas & Zalba, 2009; de Villalobos, Zalba & Peláez, 2011) and other exotic plants (Zalba & Villamil, 2002), among others. Given that the Park is a protected area, it is imperative to know the biological diversity being preserved. Although many studies have looked at the faunal diversity, biology, and conservation in the Ventania system, most are focused on vertebrates (Zalba & Cozzani, 2004; Cairo et al., 2008; Cozzani & Zalba, 2009; Repucci et al., 2009; Manfredi et al., 2012). Only a few studies have been dedicated to arthropods, such as aquatic insects (Konopko et al., 2009; Fernandez et al., 2010) and spiders (Ferretti et al., 2012). Spiders are frequently used as ecological indicators due to their susceptibility to disturbance (Clausen, 1986; Scott, Oxford & Selden, 2006), and as a consequence, are generally used as indicators to evaluate conservation values and biodiversity status. In addition, spiders are useful to evaluate the effects of habitat changes by nature-management measures (Maelfait & Hendrickx, 1998). Spider communities serve to monitoring changes in the environment. However, it is known that spiders, even when considered at the family level, exploit different prey resources and have particular ecological requirements, supporting their suggested use as functional groups across broad spatial scales (Churchill, 1998). Furthermore, species-level studies are needed given the excellent basic information on the distribution and ecology of a particular species as a prerequisite for the identification of indicator taxa (Neet, 1996). Consequently, knowledge of some ecological aspects, such as phenology, is crucial for understanding population dynamics and community ecology, and lends realism to evolutionary and ecological hypotheses (Tauber & Tauber, 1981). The spiders of the family Zoridae are widely distributed around the world, and currently are represented by 79 species in 14 genera (Platnick, 2012). Only two genera are recorded from Argentina: Xenoctenus Mello-Leitão 1938 and Odo Keiserling 1887 (Platnick, 2012). The genus Xenoctenus has four species and all are endemic to Argentina whereas, from the 27 species in the genus Odo only three, O. bruchi Mello-Leitão 1938, O. roseus Mello- Leitão 1941 and O. sericeus Mello-Leitão 1944 are present in the country. These species are endemic to Argentina and were described over 60 years ago, and to date, there is no information about their natural history or ecological aspects in Argentina. 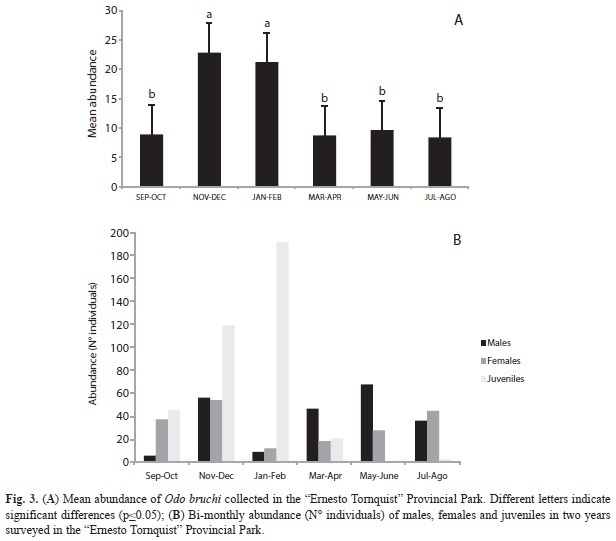 Therefore, the main goal of this paper is to present, for the first time, some ecological aspects (phenology and demography) of the spider Odo bruchi Mello-Leitão 1938 (Zoridae) in the “Ernesto Tornquist” Provincial Park (ETPP). Study area: The study area is located in the “Ernesto Tornquist” Provincial Park, inside the Ventania system in the South-west area of Buenos Aires Province, Argentina (38°00’-38°07’ S and 61°52’-62°03’ W). The natural reserve was established in 1940 and covers 67km2 of valleys and hills ranging from 450-1 000m.a.s.l. The climate is humid and temperate with an average annual rainfall of 850mm that decreases from NE to SW (Kristensen & Frangi, 1995). The average bi-monthly rainfall changes during the study period (Fig. 1) were obtained from a station at the base of the hill “Cerro Bahía Blanca”, located at 2km from the study site. The mean annual temperature is 14.5°C. The natural vegetation in the study area consists of more than 400 native species, many of which are endemic. In grassland slopes species such as Briza subaristata, Stipa ambigua, S. caudata and S. neesiana are common. Paspalum quadrifarium is present along humid slopes, and endemic graminoid species such as Festuca ventanicola, F. pampeana and Stipa pampeana are present at above 500m.a.s.l. (Frangi & Bottino, 1995). Spider collection: Spiders were sampled bimonthly using pitfall traps between September 2009-2010 (first year), and March 2011-2012 (second year). 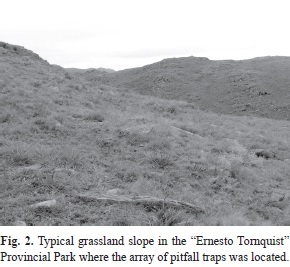 A total of 10 traps were placed every 10m along a transect of 100m parallel to the longest axis of a grassland slope with native vegetation (Fig. 2). Pitfall traps consisted of cylindrical plastic recipients of 23cm in diameter and 15cm high buried and covered with a plastic roof sustained by three metallic rods at 15cm from the soil. They were filled with 1 500mL of ethylene glycol, which prevented evaporation and acted as a preservative. All traps were examined and refilled every 60 days period. Voucher specimens were deposited in the arachnological collection of the Laboratorio de Zoología de Invertebrados II, Universidad Nacional del Sur (Bahía Blanca, Argentina). We used Pearson correlation to explore possible linear relationships of abundance of O. bruchi with precipitation, using SPSS version 14.0 for Windows (2005). Also, to compare the abundance of the spiders between sampling dates (bi-monthly) we used ANOVA non-parametric statistical tests (Kruskall-Wallis test) using Infostat (Infostat, 2008). Total abundance: We collected 799 specimens of O. bruchi during the two year survey. In the first year we collected 395 specimens and during the second year 404 individuals. Males corresponded to 27.8% of total, females 24.4% and the juveniles were the most abundant reaching 47.8% of the total. The total abundance of O. bruchi showed a positive correlation with rainfalls in the first year (r=0.92, p<0.01); however, in the second year no significant correlation was evidenced (r=0.45, p=0.36). Phenology and demography structure: We found significant differences in the mean abundance of O. bruchi between the different dates (H=14.95, p=0.0104). The months of spring-summer (Nov-Dec-Jan-Feb) were significantly higher than the other months of the two years surveyed (Fig. 3A). We found a similar abundance distribution throughout the year for the two years study. In the first year, we registered 43% of juveniles, while the percentages of abundance of males and females were similar (Table 1). In the second year we found a higher percentage of juveniles (52.5%) and the males showed a slightly higher abundance than females (Table 1). We recorded males during the entire period of study, but for the beginning of spring (Sep-Oct) and summer (Jan-Feb), their abundance was markedly lower than during the rest of the year (Fig. 3B). We also observed females throughout the year, with a peak of abundance in September-October and in November-December (spring and beginning of summer in Southern hemisphere) (Fig. 3B). We observed a gradual increase of female abundance from summer (Jan-Feb; lowest abundances) to spring-summer (Nov -Dec; highest abundances). Juveniles were more abundant than males and females, with the highest activity in the summer (January-February) (Fig. 3B). Juveniles were very scarce during the winter, we found only two individuals each year in the coldest months (Fig. 3B). From the data obtained and the non-significant correlation between rainfall and abundance during the second year, we concluded that rainfall is not an important factor influencing the abundance of this species in the natural reserve. However, the correlation was significant during the first year of sampling. Moreover, the spider abundances and the monthly distribution were quite similar to the abundances found during the first year. This indicates that there are other factors, such as seasonality, that have a stronger influence on the abundance of O. bruchi in the study area. We found an uneven activity of this species throughout the year, with the presence of active males, and thus indicating an annual reproductive period or eurychronous. However, we registered small increases in the abundance of males in spring and autumn, indicating two possible peaks on these dates. The high abundance of juveniles on spring-summer could indicate the period of hatching of this species. According to Schaefer (1987), the cycle of these spiders might be considered to be a diplochronous cycle (a type of eurychronous cycle). This cycle is characterized because the female has a longer life cycle and lay eggs in spring, and also because it presents two periods of active males during the year (Shaefer, 1987). These eurychronous species are phenological ‘‘generalists’’ with a flexible strategy that can result in successful reproduction even in unpredictable or impermanent habitats (Draney & Crossley, 1999). This feature might be a good attribute of O. bruchi to be considered a good ecological indicator. Nevertheless, more exhaustive studies are required to evaluate this species potential for this status. Unfortunately, to date, there is no information about the ecology or biological characteristics of species of Zoridae. This work represents one of the first contributions to the family, other than taxonomic kind (Mello-Leitão, 1938; Corey & Mott, 1991; Alayón García, 2002; Urones, 2005). Therefore, this study generates valuable information in a vulnerable protected area such as the pampean grassland. There would be necessary to make studies in more disturbed areas in the “Ernesto Tornquist” Provincial Park, to register the presence of Odo bruchi and its abundance. In conclusion, the results obtained in this study could be important in order to generate basic knowledge for future studies on this spider as a bio-indicator of the conservation status of pampean grasslands. The authors would like to thank the Direction of Protected Natural Areas (La Plata) and OPDS (Organismo Provincial para el Desarrollo Sostenible) for the authorization to work in the Parque Provincial “Ernesto Tornquist” (Ventania). Thanks to the Park Rangers Maximiliano D´Onofrio, Facundo Cassalle-Pintos, and Anibal Areco for assistance in field work. Also thanks to Adriana Ferrero and the Laboratory of Invertebrate Zoology II (Department of Biology, Biochemestry and Pharmacy, U.N.S.). G.P., S.C. and N.F. were supported by a CONI-CET fellowship. Received 26-IV-2013. Corrected 20-VIII-2013. Accepted 24-IX-2013.